An interesting study shows that certain California cities are hotspots for the highest average speeds in fatal automobile crashes. “The fastest cities in America are located across the country, from California to Virginia and a few places in between. The biggest surprise? 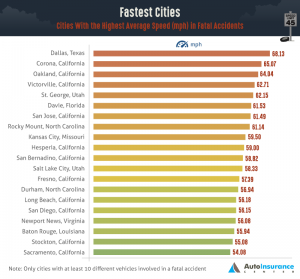 A staggering 11 of the 20 cities with the highest average speeds in fatal accidents are located in California,” says the study from the Auto Insurance Center. That said, California as a whole does not register among the top 10 states with the highest average speeds in fatal accidents. It is just in certain California cities that speeding fatalities are a bigger problem. The authors of the study, using 2104 data, analyzed the average speed of more than 12,000 fatal car crashes in the United States. They found less-populous states had higher speeds on a statewide basis. Because California is so populous, it has a high number of fatalities even though it is not among the top 10 worst states for speeding. In 2012, the National Highway Traffic Safety Administration reports, there were 916 speeding-related traffic fatalities in California—second only to another populous state, Texas, with 1,247. Three California roads are among the most dangerous in the nation for speeding fatalities. They are I-10, with an average speed of 68.66 mph in fatal accidents; I-580, with an average speed of 68.26 mph in fatal accidents; and I-5, with an average speed of 66.81 in fatalities. Speeding is a factor in about 30 percent of accidents nationwide, according to the National Highway Traffic Safety Administration (PDF fact sheet on speeding here). In 2012, there were 33,561 fatal accidents on U.S. roadways, of which 10,219 involved speeding. That’s 30 percent. A big factor in speeding deaths is that many young people who speed don’t wear seat-belts, NHTSA says. Condition of roadways is another big factor. On dry roads, speeding was a factor in 20 percent of fatal crashes; on wet roads, in 23 percent; on snow, 36 percent; and on icy roads 44 percent, NHTSA reports. Another factor is that it takes time for the brain to process what the eyes see. If there is something in the path of a driver’s car, such as another car or a pedestrian or an object, the brain has a delay between the time the driver sees the obstruction and then decides how to react to it. 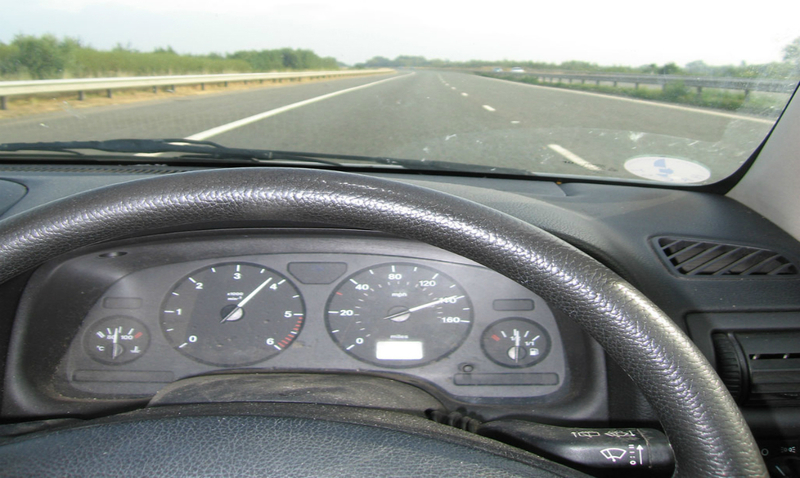 At 55 mph, a vehicle covers 142 feet during the 1.75 seconds it takes the driver’s brain to process what the eyes see. The vehicle may travel another 61 feet while the driver comes to the realization he must apply the brakes. And then the automobile could go 216 feet farther before coming to a stop. That’s 419 feet before the vehicle comes to a halt. And that’s just 55 mph. California law allows drivers to travel at 70 mph on some roads. Then, consider the force of impact. At 60 mph, the force of impact upon whatever the driver’s vehicle strikes is 9 times greater than at 20 mph. So at high speeds, crashes can be devastating. Tickets can be issued to a person going 45 mph in a 55 zone, for example, if an officer deems he’s going “too fast for conditions.” In other words, the speed limit is the upper limit of what is legal, not the minimum. And if a speeding driver causes an accident in which people are injured, that fact can be used against him in a lawsuit or insurance settlement. If you are injured by a speeding driver or other type of driver’s negligence, please consider hiring an attorney to represent you. An attorney can make sure you obtain the highest compensation for your medical bills, lost wages, property damage, pain and suffering and possibly other damages, including the loss of a loved one. Whether you hire an attorney or decide to settle with an insurance company on your own, remember that insurance adjusters are not your friend no matter how friend-lily they act. Their job is to minimize the amount their employers pay to you, the victim. At least let an attorney read over any settlement documents before you sign them. Once you sign, that deal is final, and you can’t go back and collect more money later except in very unusual circumstances. The California personal injury attorneys of Krasney Law are experts in the area of automobile accidents, motorcycle accidents, bicycle accidents and more. Krasney Law can help those who’ve suffered a car accident obtain maximum amounts from insurance companies or defendants, whether by settlement or jury trial. Call us for a free initial consultation today at (909) 360-7200. We collect no fee unless there is a recovery or the case goes to trial.